Where to Buy Triple Superphosphate Fertilizer, Triple Superphosphate Fertilizer 0-45-0 - 50 Lbs - $64.95 for Sale with Fast Free Shipping! Triple Superphosphate Fertilizer 0-45-0 - 50 Lbs is high phosphorus plant food which promotes root growth and maturity. MOP Muriate of Potash Soluble Fertilizer.. 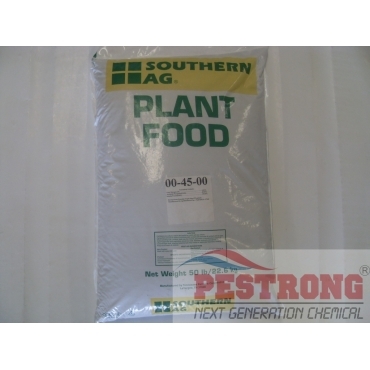 Triple Superphosphate Fertilizer is perfect for all acid loving plants. Highly effective in eliminating phosphate deficiencies in all crops, under all soil conditions. It is uniformly sized and blends well with most fertilizers. It is a preferred source of P2O5 in high analysis bulk blends. Most effective when applied pre-plant in bands or broadcast incorporated to alfalfa and other legumes. However, it can be applied effectively as a topdressing on established stands any time during the year that soil and weather conditions permit. For annual crops it is most effective when tilled in prior to planting. At planting; Use 5 lbs. per 200 sq. ft. Vegetables; 1 lb. per 50 foot of row. Roses or large shrubs; 0.25 cup per plant. Fruit Trees; 1 cup per inch of trunk diameter. Great for adding in phosphate to the soil. It worked perfectly for my plants.